Host Will Lange hikes, paddles and explores New England, meeting people who share his love of the outdoors, in the 12th season of this award-winning series. Radio host Ray Brown joins a group of his friends at Boston's Public Garden to go birding - right in the middle of the city. 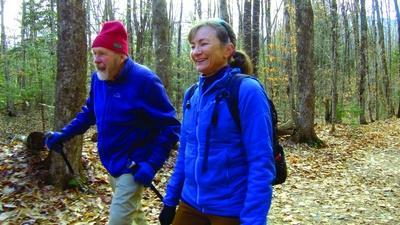 Joe Nyberg is 81 years old and lives with stage 4 cancer but it doesn't keep him off the hiking trails. Fjords, Viking ships and the Lofoten Islands. Perhaps we're not in Kansas anymore. Willem takes a guided hike deep into the woods where he learns how to slow down and experience nature with all his senses. Along the Appalachian Trail at Smarts Mountain near Lyme, Warrior Hikers trekking NH's section of the AT meet host Willem Lange. Take a trip back in time with Windows to the Wild host Willem Lange and his wife Ida as they return to Hurricane Island, where they lived and instructed students in character development through self- discovery, while raising their own children. The Parker River National Wildlife Refuge on Plum Island is a favorite destination for birders worldwide. We'll get a look at fall foliage from a vantage point that few leaf-peepers get to enjoy: from the skies in a hot-air balloon. Join host Willem Lange on a tour of a Cambridge oasis -- the Mount Auburn Cemetery. Climbing Mount Moosilauke is a New Year's Day tradition for some hikers. Lake Winnipesaukee is flooded with vacationers every summer, but hidden from many is a 43-acre island of rocky woodland that has avoided development and modernization for the past 100 years. Clear icy water cascading from rocks between Mt. Madison and Mt. 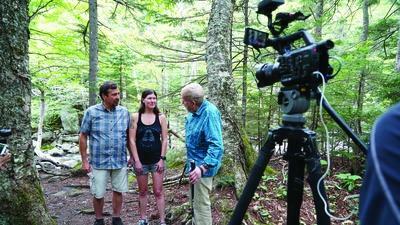 Every chance he gets, Alfred Balch of Lyme, NH, ventures into the woods to capture the wild sights of the outdoors on video. Willem soars the thermals with Peter Stauble, chief pilot of the Franconia Soaring Association. Willem meets the North Country's four-legged hiking legend, Atticus the Miniature Schnauzer, and his companion Tom Ryan. The Appalachian Mountain Club operates a string of lodges in northern Maine. History lives on Mt. Waternomee in Woodstock, NH, where in 1942 an American B-18A bomber crashed with seven crew members aboard. Prepared for challenging winter elements, host Will Lange camps outdoors in snowy Vermont with outdoor educator and survivalist Scott Ellis. Some birders have never seen a bird. Host Will Lange joins a group with visual disabilities for a Massachusetts Audubon Birding by Ear trek on Plum Island. The Fells Historic Estate & Gardens, once home to diplomat John Hay who served Presidents Lincoln, McKinley and Roosevelt, has 83 acres of conserved forest, trails and gardens. In the woods of Vermont, host Will Lange spends a day with naturalist Susan Morse. Hikers seeking spectacular scenery and to raise money for the Mt. It takes months to hike the 2,190 miles of the Appalachian Trail. Dianne Fallon's been planning trips since she was 11. Outdoor adventurist Scott Ellis and his family join host Willem Lange for a night of camping and exploring in Maine's north woods. Members of Outdoor Afro tackle Mt Washington's Tuckerman Ravine as they celebrate black leadership in nature. Host Willem Lange paddles the Connecticut River with pilgrims on a ecological and spiritual journey. A plane crash, a fire tower and incredible views -- writer and adventurist Dianne Fallon takes us to Mount Belknap to share these and other secrets of the mountain. Renowned NH chef Jayson McCarter hikes Mount Major with several dozen chefs to raise awareness about hunger. Longtime Boston meteorologist Barry Burbank heads up Frankenstein Cliff Trail with his son Trevor. Harvard physics professor John Huth shows why learning the art of ancient navigation can save your life. What happens when the mind is willing but the body is weak? 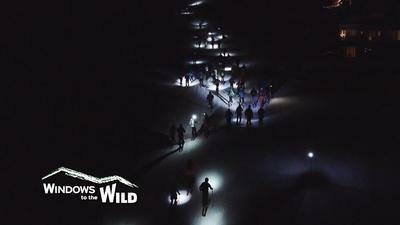 Host Willem Lange and best-selling author Tom Ryan discover ways to keep on moving. What does a hiking couple do when they decide to get married? Stage the wedding on Mt.